It's time to don those shades again. When I think of Human Revolution, I think of black and gold. Few big-budget games have such a distinctive look, but that’s part of what makes Eidos Montreal’s prequel so immediately striking. As a Deus Ex fan, I was sceptical when I heard a new game was in development. But then I saw those first screenshots, of a futuristic Detroit bathed in shades of black and gold, and knew the series was in good hands. Set in 2027, 25 years before the first game, the prequel begins with Adam Jensen, head of security for Sarif Industries, being critically wounded in a terrorist attack. On the brink of death, Jensen is saved by his boss, David Sarif, who reconstructs his body with experimental cybernetic augmentations. An upgrade he, famously, never asked for, but that gives him the power to hunt the people responsible down. While JC Denton was trained from an early age as a counter-terrorism agent and fitted with advanced, discrete nanoaugs, Jensen is thrust into the events of Human Revolution against his will, and his body is constantly fighting against his new implants. He, and other augmented humans in this dystopian world, need a steady supply of an expensive drug called Neuropozyne to prevent their bodies from rejecting the augmentations and killing them. Add to that a general distrust of augmented people from so-called ‘naturals’, which boils over in the sequel, and life with cybernetic implants is often more trouble than it’s worth – even if you can punch through a concrete wall and run faster than a gazelle. Of course, for the player, Jensen’s augmentations are an incredible amount of fun to experiment with, and make for a wonderfully diverse immersive sim. For the stealth-conscious cyberpunk there’s the Glass-Shield Cloaking System, which lets you turn invisible for up to seven seconds when fully upgraded. You can also upgrade the Hermes Cybernetic Leg Prosthesis to jump to superhuman heights, opening up new ways to sneak into places. Stealth is the most satisfying way to play Human Revolution, with multiple paths through the sprawling levels and plenty of vents to squeeze through. But if you’d rather make a mess, you can upgrade your Cybernetic Arm Prosthesis to reduce weapon recoil and throw heavy objects at people. Or use the Typhoon Explosive System to turn yourself into a human grenade, unleashing a blast of lethal shrapnel, taking out multiple enemies at once, including security robots. It’s a hugely entertaining collection of powers, and combining them to create your own bespoke play style is an important part of what makes the game great. But, really, it’s the world that draws me back to Human Revolution. It’s one of the most visually compelling visions of the future on PC, with a cluttered, lived-in feel that transcends the dated visuals. Both cities, Detroit and Hengsha, feel slightly claustrophobic and boxy by today’s standards, but the visual flourishes—particularly the neon billboards and that dramatic double-stacked metropolis—still look fantastic. It remains an incredibly atmospheric setting, weighted by Michael McCann’s moody, understated score and some richly immersive ambient sound design. I wanted every object to have its own concept art and individual furniture sets for different offices. He could have turned me down right then and there, but at Eidos Montreal we believe this kind of detail is absolutely necessary to create a believable world. “I approached our producer, David Anfossi, early in preproduction and told him that I’d need to design like 1,400 props,” says Jacques-Belletête. “Anything from cool sci-fi machinery, a given for this kind of game, to coffee cups and keyboards. I wanted every object to have its own concept art and individual furniture sets for different offices. He could have turned me down right then and there, but at Eidos Montreal we believe this kind of detail is absolutely necessary to create a believable world. We had to invent a hundred brands and company names, as well as their logos, which is expensive to do, but really adds to the richness of the setting. But which version should you play? The original release of Human Revolution caught deserved flack for its awful boss battles, which didn’t respect the player’s augmentation choices, forcing stealthy players into combat situations. “I’m a shooter guy and I’m coming into this not knowing a lot about Deus Ex,” said Grip Entertainment president Paul Kruszewski, the company the boss battles were outsourced to, in a revealing behind-the-scenes video. But in the 2014 Director’s Cut, the boss battles were overhauled, giving you additional ways to beat them—including, importantly, stealth options. This version also includes the brilliant Missing Link DLC, AI improvements, and better lighting—although, for some reason, the divisive gold fi lter has been massively reduced, stripping away some of the game’s visual identity. If you can deal with that, the Director’s Cut is almost certainly the best way to play Human Revolution today. Seven years on, this is still a great immersive sim, and well worth revisiting. The weak link is the writing and story. I love Jensen, which is probably more to do with Toufexis’ performance than the actual script, but there’s something slightly cartoonish and unconvincing about his supporting cast. And the various parallels to contemporary society and culture have all the fi nesse of a drunk gorilla swinging a baseball bat—something Eidos Montreal doubled down on in the next game, Mankind Divided. That said, the story does provide a few memorable moments. In an interview this year with PCGamesN, David Anfossi admitted that while he considers Deus Ex the “brand of the studio”, no third game is currently in the works. “We’re a big studio with close to 500 people now, but at the same time we’re working on three other projects. 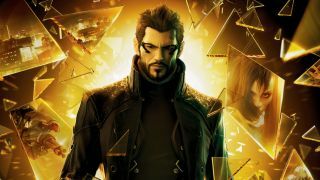 When it’s time for Deus Ex, it’ll be time, and we’ll do it correctly.” So Deus Ex isn’t dead, but we might not play a new one for a while—which is as good an excuse as any to return to Detroit for another stint as Adam Jensen.